The Stakeholder Circle® methodology and tools have been in use for several years. However, many potential business users found accessing the system difficult, with company policies preventing the installation of the necessary software. By moving to ‘the cloud’ and transitioning to a standard Microsoft operating environment these issues should be in the past. Anyone on any computer platform can access the tool running on our secure servers and larger corporations can elect to install the system on their own intranets. The flexibility of ‘the cloud’ has also allowed us to offer an increased range of options to suite organisations of all sizes. We have set up a separate server to allow interested people to try out the new ‘cloud’ version of the Stakeholder Circle® register on-line at http://www.stakeholdermapping.com/free-trial and your access information will be emailed to you within a few minutes. The Chartered Institute Of Building (CIOB) has launched a new contract for construction and engineering projects. The CIOB Contract for Complex Projects has been written for the 21st Century. It is designed to permit the CIOB’s Guide to Good Practice in the Management of Time in Complex Projects to be put into practice. The contract can be used for collaborative design with a building information model (BIM) and anticipates and encourages competence in the use of computerised transmission of data. It requires collaborative working in the management of risks and transparency of data used in such management. The contract has been drafted to be used in any country and legal jurisdiction around the world to provide a means of managing the causes and consequences of delay (the single most common cause of uncontrolled loss and cost escalation in complex building and engineering projects) where the design is produced by the employer, the contractor with or without a building information model. It is written in plain English, suitable for both building and engineering projects and may be adopted for other types of work. It can be used for turnkey, design and build, for construction only, or for part contractor’s design, both in the UK and internationally. It permits a variety of contract documents including BIM (building information model) and requires electronic communications either via a file transfer protocol or a common data environment for collaborative working. The contract contains new roles for the Project Time Manager, Design Coordination Manager and Auditor, as well as the Contract Administrator and the design team. It requires complete transparency in planned and as-built information in compliance with the CIOB’s Guide to Good Practice in the Management of Time in Complex Projects. It is currently the only standard form of contract available which requires a resourced critical path network, a planning method statement and progress records to a specified, quality assured standard, with significant redress for a failure to comply with the contract requirements. The contractor’s schedule (or programme as it is called in other contracts) is to be a dynamic critical path network in varying densities, described and justified in a planning method statement. It is to be designed in different densities compatible with the information available, reviewed and revised in the light of better information as it becomes available, updated with progress and productivity achieved and resources used and impacted contemporaneously to calculate the effect of intervening events on time and cost (see more on Schedule Density). The contractor’s schedule is not only the time control tool but also the cost control tool against which interim valuations are made and the predicted cost of the works is calculated contemporaneously permitting out-turn cost and total time prediction on a daily basis though the updated working schedule. The contract contains detailed requirements for the identification and use of time and cost contingencies, defines float and concurrency and sets down rules for their use. It provides the power for the contractor to keep the benefit of any time it saves by improved progress as its own contingency, which cannot be taken away. It contains a procedure for contemporaneous expert resolution of issues arising during construction. In the absence of reference to experts specified issues concerning submittal rejections and conditional approvals are deemed to be agreed, helping to avoid doubt about responsibilities and escalation of disputes. The experts used during the course of the works can be called as a witness by either party in any subsequent adjudication and/or arbitration proceedings and, in order to help to give transparency to the way dispute resolvers deal with the contract and help to make sure it functions in the way it is supposed to, the adjudicator’s decision and/or arbitrator’s award is to be a public document, unless the parties agree otherwise. The Governance System is responsible for setting strategy and ensuring resources are used effectively (for more on this see: WP1033 – Corporate Governance). To achieve this, it is heavily reliant on the organisation’s management system and additionally, the Board may have some involvement in the management processes (eg, approving very large projects). The Management System manages the entire organisation within, and supporting the governance framework. Executive management are responsible for creating an organisation capable of achieving the objectives defined by the governance system and also capable of providing assurances to the governance system that resources of all types are being effectively and ethically used. Middle and front line managers are responsible for implementing the work. 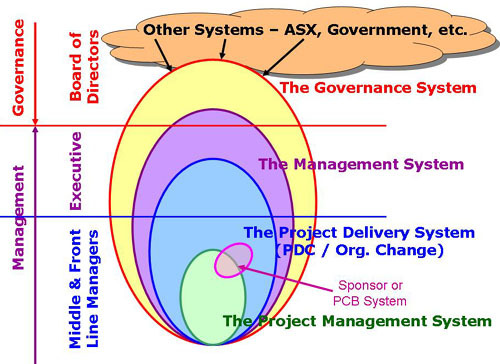 And naturally, a core component of the Project Delivery System are the individual Project Management Systems (and Program Management Systems), each system responsible for creating the ‘deliverables’ the project or program was initiated to ‘deliver’, for the organisation’s management to make effective use of, and generate value. Specialist sub-systems such as a Project Control Board (PCB) operate within this overall structure to fulfil specific purposes. Our previous post, Management -v- Governance described the functions of the three key levels of management, the Board, Executive Management and Middle / Front Line Management (or General Management); whilst these three levels of ‘management’ have quite distinctly different roles and responsibilities, in a well governed and well managed organisation each ‘system’ is integral to and supports the objectives of the higher system. However, in dysfunctional organisations, the different responsibilities become merged or blurred to the detriment of all. Possibly one of the key reasons middle managers working in IT and Project Management feel they are involved in ‘governance’ is the simple fact that the Board responsible for the governance of the organisation has failed in its responsibility to provide effective governance to the IT and Project Management functions, and the middle management level is trying to fill the void? More on this in my next post!